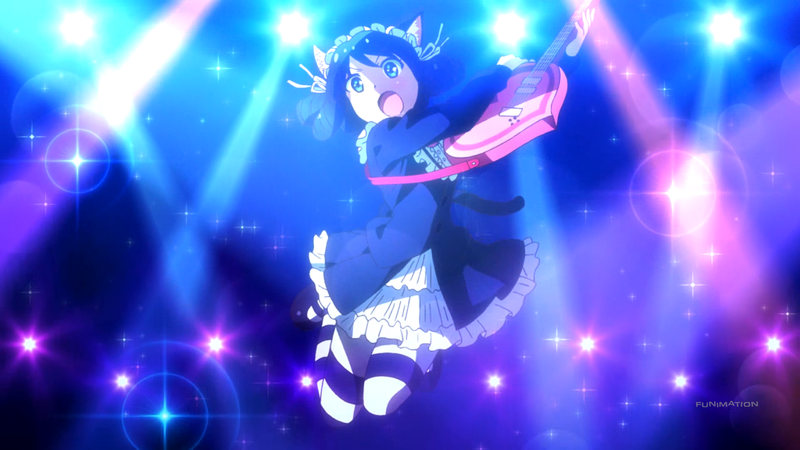 Review/discussion about: Show By Rock!! There’s this game series that is pretty popular, or at least, it was during its heyday. This video game is called “Guitar Hero.” I was never a music guy myself – I couldn’t play brass instruments, the “cool” drums, or jam out on an acoustic. But I had “Guitar Hero,” where playing was simpler, screw-ups were okay, and I got to have fun with a whammy bar. I got so good at the game that I managed to beat “Through the Fire and Flames,” considered one of the best “boss battles” in gaming history. I was capable of making music, albeit dumbed down, but it was music nonetheless. With it brought happiness and plentiful memories that I’ll never forget. Show By Rock!! looks at “the power of music,” but unfortunately becomes tone-deaf along the way. Rock stars (pun intended) Cyan Hijirikawa, a young girl too nervous to join her school’s band club. One night, she finds herself magically whisked away to Midi City, the land where music is king. Alongside ChuChu, Retoree, and Moa, “Plasmagica” aims for the top of the sound-filled metropolis. Music is a pretty crazy phenomenon when you take a step back to look at it. There’s a lot that goes into crafting tones, beats, and melodies, but music doesn’t always have to be so involved. If you take a bunch of pebbles and put them in a cup and shake it around, you just made music. It might not be very good or worth listening to, but it is music nonetheless. No matter how rudimentary or intricate a musical piece becomes, everyone can understand the sounds that are produced. Music is like math in a way; it’s a “universal language” that people of any background or creed can speak with. One doesn’t have to live in Japan to appreciate their style, and the same goes for other places. Countries in Africa, Europe, and Asia have their own methods of producing fun-loving music, and while someone might not get the culture or even the notes themselves, he or she can still understand the emotion or message those musical pieces are infused with. This is what Rock tries to show. Bands like “Plasmagica,” “Shingancrimsonz,” and “Criti Crista” each has a signature style and distinct personality, but they are able to connect with one another and the fans that follow them through the very music they play. What’s even more profound is the effect their performances have. The joy they bring, the tighter bonds they establish between each other, and the inspiration they instill; music does so much more than simply reverberate in our ears. There are instances in the show that demonstrate this thinking. There’s Aion’s descent into negativity cured by his duo with Crow; Chuchu’s true motivations being known thanks to a simple practice session; and Cyan’s nighttime singing bringing her group closer than ever before. Many events mirror these – showcasing music’s strange ability to strengthen relationships – reinforcing the idea that music is a force to be reckoned with. Unfortunately for the anime, there are two issues that persist throughout the season and become apparent by the show’s conclusion. First is providing the aftermath of what music brings. It’s nice seeing the lead up and eventual culmination, but the show oddly refuses to use the bands and their relationships to further the narrative. Something simple is using the smaller groups visited and helped later on to impact the plot’s direction, but the show doesn’t include them. This can also be seen in the finale; it isn’t music that saves the day, but a covert operation led by a rat girl and something akin to Cupid’s bow and arrow that protect the city. Music fixes the conflicts but never seems to be used to the extent to which the anime places emphasis on. Speaking of conflicts, the second issue that Rock faces is sustaining dramatic tension. The separate scenarios usually occur and finish in the episode in which they are introduced. Those three previous examples brought up a couple of paragraphs ago are each resolved over the course of a single episode instead of being elongated. Introducing one conflict after another is an okay approach, but such a tactic prevents the show from feeling as dire as it intends to be. This is especially true for Rock, considering how it doesn’t use the aftereffects of its conflicts to its advantage and how it isn’t designed as a slice-of-life offering due to the overarching dilemma. Glancing at Rock’s art style leaves one in a state of wonderment. Midi City and the surrounding areas are rife with color. 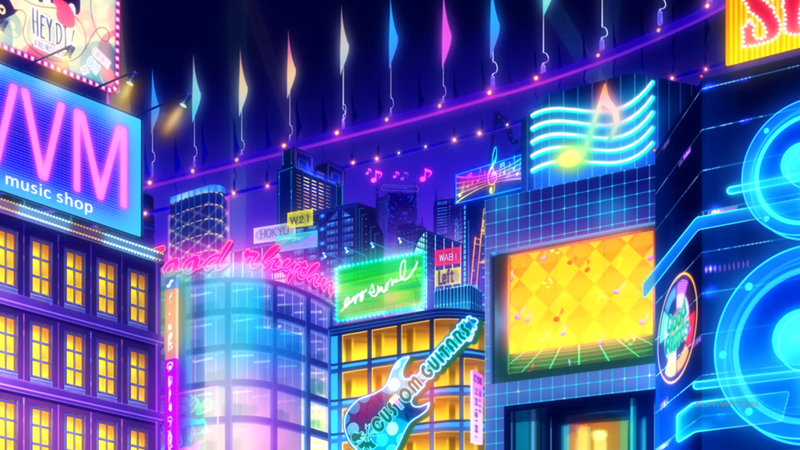 The buildings are mostly blue due to the “electric” feel of the place, but the signs, the venues, and the various nuances take on quite the vibrant hues that make the environments shine brilliantly. But what Rock does better than almost any other anime is its CG usage. The locations vary by theme (depending on the band in question), but it’s the characters and their designs that give it an appropriate feel. Essentially, they appear to be plastic models, making them feel out of place but in a way that strangely fits the style and tone of the show. When the characters are not in three-dimensional mode, the designs maintain high quality. Each cast member is, more or less, an animal of some kind; Cyan is a cat, Chuchu is a bunny, etc. Their animal backgrounds provide them with small details – such as Moa’s fluffy hair (since she’s a sheep) and Rom’s spotted cloak (since he’s a cheetah) – but the show goes beyond such symbolism. They all have their own distinct colorings, accessories, instruments, and clothing that separate them not just from individual bands but from their own group members, too. Actual animation remains somewhere close to average. What’s interesting is that the CG segments are actually quite above average in execution, and it appears that they will be used regularly. Sadly, the show doesn’t use this element as much as it could and even as much as it should have. 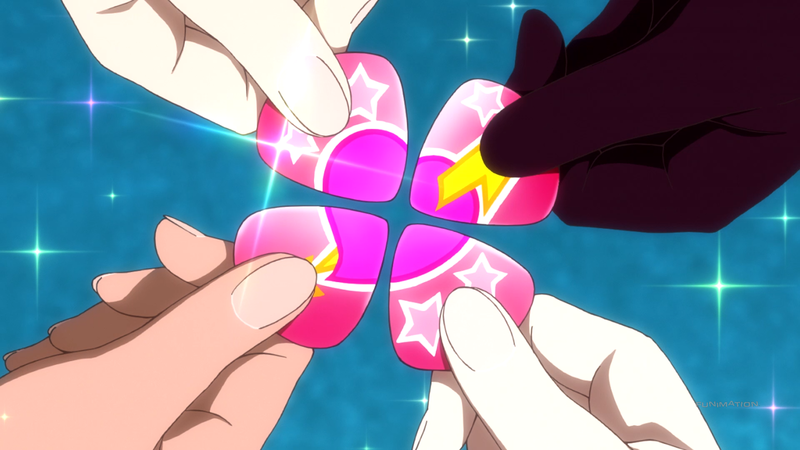 During the two-dimensional scenarios, which comprise the majority of the show, the anime surprisingly doesn’t have the bands perform their music, mostly saving it for the extra dimension outings. Besides feigning the need to animate at times, there is a lot of standing around and talking, with the occasional trek through the forest or walk down the sidewalk to bring about variance, but nothing too extravagant. Rock is another anime that actually has a larger cast size than at first perceived. While it does try to give different members their own time in the spotlight, many of them are quite weak, mostly due to time constraints and focusing on one character in particular only to then forget about them later on. This happens specifically to the major members of “Plasmagica.” Starting with Moa, she is technically an alien from another planet, visiting to gain information about the one she’s on now. Even with the uniqueness of the festivities around them, she is still an outlier. But the show doesn’t divulge into this side of her after the band comes together, and in fact her presence is minimal near the end. Retoree follows the same trend; there is an episode dedicated to her and her difficulty in holding friendships with others. However, following her realization that the people closest to her now are the very friends she was seeking, she isn’t looked at in-depth again. Chuchu fairs a bit better, but not by much. Chuchu’s backstory and mannerisms indicated a certain amount of jealousy towards others. She saw herself as the best, so when Cyan came along and “stole her thunder,” she slowly but surely became a bit agitated with her new band mate. Her selfish desires – of wanting to be the best, doing whatever it takes to reach the top even if that means ditching her companions – comes to light, but Cyan, Retoree, and Moa aren’t particularly phased. They understand that everyone is a little selfish from time to time, but that doesn’t mean that Chuchu’s actions didn’t help them and the band out. They accept Chuchu for who she is – as a fellow band member, a person, and most of all, as a dear friend. As for Cyan, her character is one of the worst that the show has to offer. It’s rather unclear what her character’s purpose is besides acting cute, fighting the bad guys, and being the fourth person of “Plasmagica.” The very beginning of the season painted her as someone with self-esteem issues, as a girl without the courage to do what she really wanted. For the rest of the season, the show then places its focus on the other girls, other bands, and even other characters that don’t directly influence Cyan and her development. She’s quite passive, being nice and saying kindhearted words to those around her on occasion, but never really standing out as a person let alone as the main character of the anime. In other words, she never seems affected by what happens, instead acting and speaking as she regularly does, going about her business the same way as always. It’s not until the conclusion that she finally decides to muster the courage to do what she could not, but without the proper build-up, it happens too suddenly and seemingly out of nowhere. It makes sense that her character would progress to this point, considering where she started, but nothing in the middle indicated that she was heading there. There are other character issues as well, such as Rom and Shuuzou’s past relationship not being fleshed out enough or having little to go off of in regards to Yaiba (the “hence” guy) and Maple (the president of “Banded Rocking Records”). But the worst is Dagger, the villain of the series. He’s a business tycoon who wants only the best of the best “working” for him. His main goal is to be the ruler of Midi City, but in similar fashion to Cyan, he doesn’t do much of anything. He normally sits on the sidelines, having his underlings do most of the work. When he finally decides to take part in the action, his motivations and actions aren’t very rational; he had Grateful King make him the best written song ever, which took the entirety of the season to compose, but it’s never used by him or anyone else. Even his original goal is strange, given how popular and successful his company already is. As a villain he fails, and as a character he fails even harder. The opening theme is a pretty fun song overall, with the English words, clapping, and quick beat. Some of the vocal segments aren’t too pleasing to the ear and it’s not too catchy, but it at least maintains the rock-n-roll vibe that is prevalent in the series. The ending theme, on the other hand, is great. It’s still a fun track, but manages to mix up its tone and instruments enough to make the piece feel special. The lyrics and beat are likewise easy to follow, making it a nice piece to listen to both here and outside of the show. The rest of the soundtrack is most notable for its plethora of insert songs. Each band has approximately one song they are known for, each with their own style. 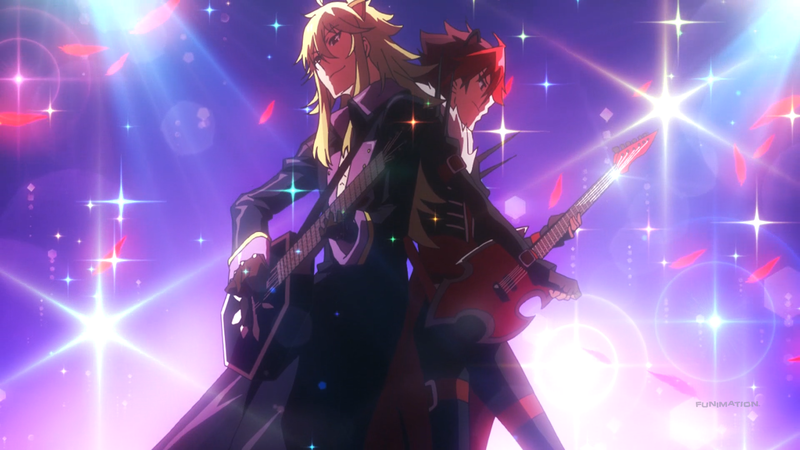 “Shingancrimsonz” is brooding, “Tsurezurenaru” is all about their Japanese culture, and “Trichronika” is more pop than rock. As standalone pieces they’re fine, but nothing entirely impressive. The rest of the soundtrack consists mainly of variations of the OP which are largely forgettable. Voice acting is somewhere around, to slightly above, average. Special shout-outs are deserved for Ayane Sakura as Moa for her constant “Pyuru!” and high-pitched yet non-grating voice and Hiroyuki Yoshino as Grateful King for his cool rocker accent and way of speaking. I really liked this one when it first started. 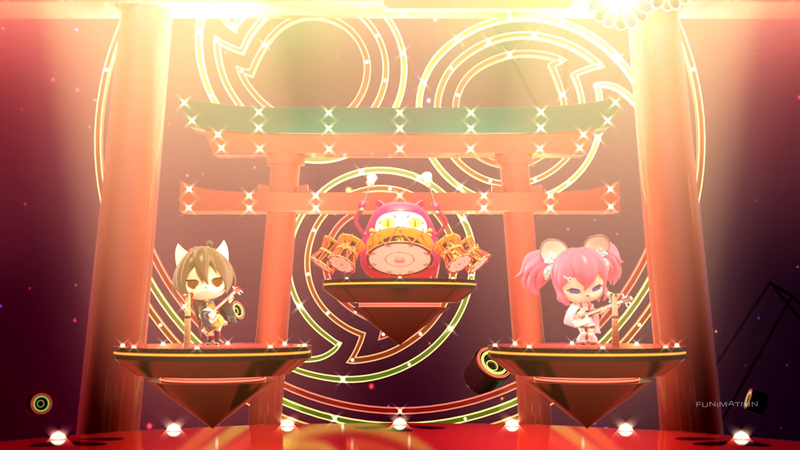 The comedy was making me laugh, with Retoree’s overreactions to Cyan’s cuteness, Moa’s affable happiness, and the members of “Shingancrimsonz” looking up to Rom as a leader and a “working man.” Watching very well-done CG animation was refreshing, too, since most anime have such a hard time in that department. The more it went on, though, the more it lost its charm. I love “moe” shows a lot, but there were a number of factors that kept reducing the entertainment it provided for me. Cuteness began to wane as drama took precedence, the importance placed on other cast members that weren’t “Plasmagica” wasn’t enticing, and the show playing up the “dark monsters” but only using them sparingly prevented the anime from using the CG that it demonstrated it could nail. On top of all this, while the anime didn’t necessarily feel “repetitive,” it didn’t try to do anything new once it did what it wanted. The same jokes, the same performances, and the same lines were often had, depleting the show’s ability to keep me hooked. Show By Rock!! is definitely a show about rocking (and rolling), using music in nearly everything that it does. The art and animation can be splendid to see at times, but it isn’t enough to make up for the problems plaguing the narrative and the characters being weak in their execution. It even struggles slightly in the sound department, ironically enough. 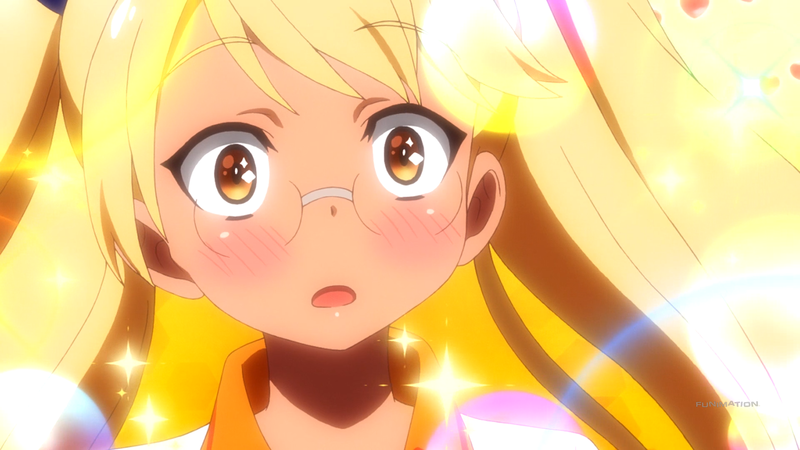 It can be cute and it can be musical, but as the ED lyrics allude to, it’s a decrescendo from start to finish.